Peach Pomegranate Jam - Trivia: The fruit of the pomegranate is a berry. The pomegranate originated in Persia. The peach is a stone fruit. The peach is native to China. Blending the tart pomegranate with the sweet ripe peach creates a unique, exciting fresh taste. Ideal for spreading on fresh baked scones or popovers, with Odell's clarified butter. Stir a spoonful into pan sauces for a delicious sauce for pork or chicken. Warm peach pomegranate jam & drizzle over vanilla ice cream, or poundcake. 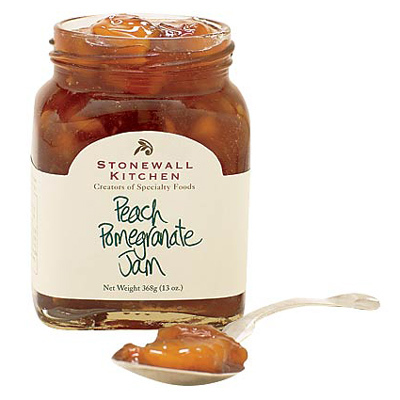 Stonewall Kitchen Peach Pomegranate Jam.